I don´t know where to begin or end this blog. Maybe I should just let the words run out of my hands. A lot of things have happened since my last blog. Picture is taken Sept. 8th this year. 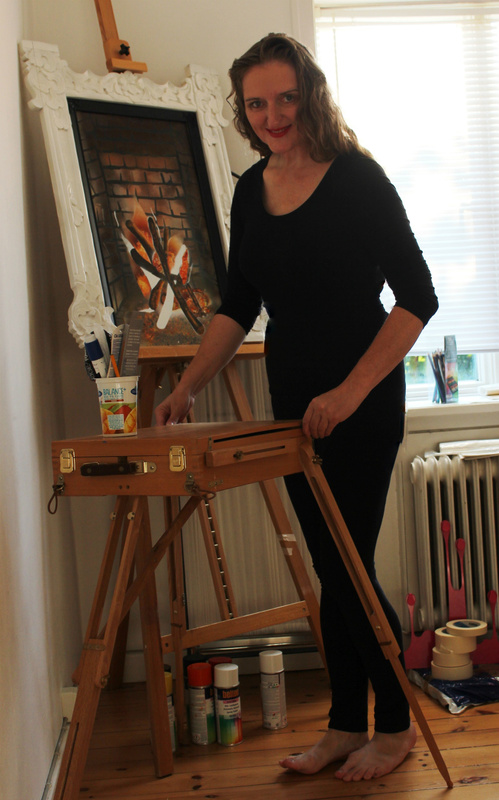 Had to pull myself together, do my hair and put on some red lipstick in order not to look like a maggot next to my newest artwork, a self-portrait, " Fireplace1,- Anaphylactic shock," which where unfinished when the pic was taken. I think it might be finished now. The more I watch it, the more it gives me the shivers, because something appears in it, which I need to come to terms with. Coming to terms through my art with all my traumatic experiences this summer, starting with the anaphylactic shock I went into during a needed medical test at the hospital June 14th this year. I have to take it one step at a time, as I can´t handle all of it, and I´m almost over the physically consequences of this shock. Self- portrait "Fireplace1,- Anaphylactic shock", spray paint art on masonite plate and self-created furniture- craft fireplace frame, might stay in my private atelier for a while until I have finished losing myself in it. Actually, I should have finished it for an exhibition at Louvre i Paris this autumn, but dued to my illnes I didn´t reach the deadline. I have been working on developing my own 20 spray paint art tecniques since 2014, it´s another new media for me. I still develop as an artist, and don´t worry: I use masks and protection. I suffer from almost all of these described symptomes, except depression and confusion. My kidney stone attacks are the worst, sometimes up to 5-6 hours duration each, so I have to get rid of this adenom in one of my parathyroids in my neck, which produces extra PTH-hormone which raises the calcium in my body to an unhealthy level, giving me a lot of pains and sleepless nights with a stone-throwing kidney. I spend most of my mornings feeling half dead in the sun in my new private atelier wrapped in a carpet waiting for my inner "war" to fade out, so I can get some sleep. In other words: I have a hormone disease. From medically site my body is right now being prepared for a surgery. Diets have to be followed. More tests from my thyroid glands have to be done before this benign tumour can be taken out. There is no time limit on this process. Each time a new test is scheduled another month passes by. I don´t know when this surgery will take place, just that I ´m have to stay near my hospital in Denmark ready to clean my calendar, when the it is my turn in the surgery queue. Inside my throat in my gullet I have other serious troubles. Another diagnosis or 2 might be on their way from another hospital. Examinations are in progress here, too. Another surgery or 2 might come up within the next year, and I have to heal physically and mentally between them all and my body have to steady and get prepared for all of them. I´m glad that I have given myself and my medical treatment 1 1/2 year for fixing my health challenges. Almost 1/2 year has passed now, and I haven´t been fixed yet. It´s impossible for me to plan just 1/2 year ahead, because I don´t know what the future brings. If you think you´re in good health it´s because you haven´t been examined carefully enough. Bad, but artistically VERY inspiring situation.